In the wild, reptiles, amphibians and invertebrates rely on the day/night cycle for proper lighting and comfortable temperatures. In captivity, they require the same natural transition from day to night – nocturnal animals especially need enough lighting during the night to hunt prey and seek mates. The new Exo Terra Day & Night LED from the Rolf C. Hagen (USA) Corp. offers an energy efficient fixture that switches from cool, bright day mode to dim, blue night mode. 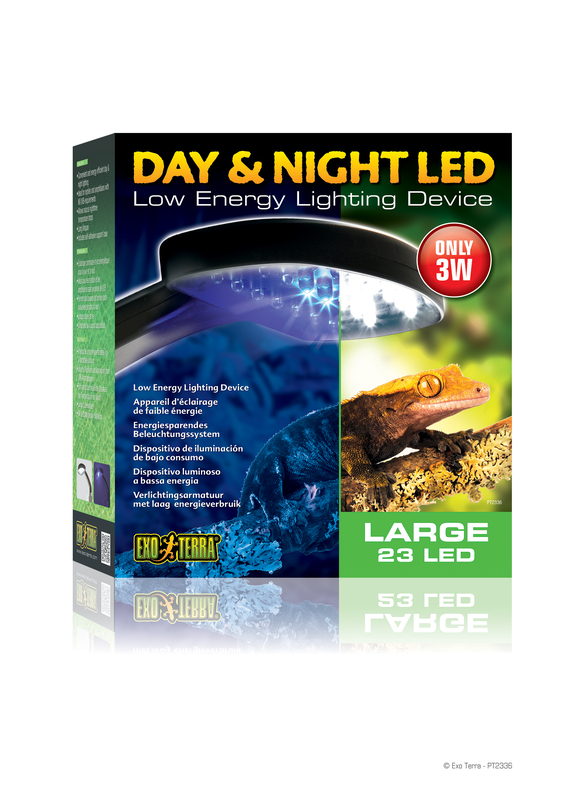 A lack of natural day and night lighting can be detrimental for snakes, nocturnal geckos, frogs, newts, salamanders, spiders, scorpions and other terrarium dwellers without UVB requirements. When lights are turned out at night, the habitat may become too dark and disorienting, especially for nocturnal creatures. Standard bulbs can also become too hot for these pets during the summer months. The Exo Terra Day & Night LED lamp includes a simple button that switches from bright daylight mode to dim night mode. Both settings are cool and energy efficient, so they won’t overheat pets – but instead allow for a natural nighttime temperature drop. The night setting produces a soft blue light that mimics natural moonlight. The shimmering night lighting allows owners to observe their pet’s nocturnal activities in an unobtrusive way – giving unique insight into the animal’s behavior. It’s perfect for nocturnal pets that hunt for prey outside of daylight hours. This stylish black light fixture is built to suit all types of terrariums. It includes self-adhesive base support to help hold the light in place. The LED is built for a minimum heat output and maximum light output, so it consumes less energy and has a longer lifespan than standard incandescent or fluorescent light bulbs. The new Exo Terra Day & Night LED is available in a Small 2-watt size with 14 white LEDs and 1 blue LED, or a Large, 3-watt size with 22 white LEDs and 2 blue LEDs.MSRPs for this fixture are $38.99 & $48.99 for Small and Large sizes, respectively. For more information, visit www.hagen.com or call 1-800-225-2700.